Brett Kavanaugh’s confirmation to the Supreme Court means liberals should get their “coat hangers” ready since abortion will soon be outlawed, according to an elected official in West Virginia. 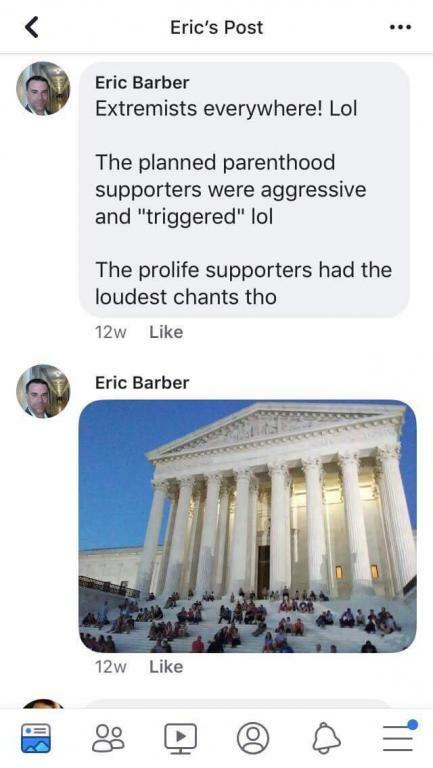 Parkersburg City Councilman Eric Barber, who opposed the secularization of the city’s meetings that resulted from a lawsuit by the Freedom From Religion Foundation, was responding in a private group to West Virginia Sen. Joe Manchin’s announcement that he would support Kavanaugh’s confirmation. In his reply, the local legislator showed he doesn’t understand women’s rights or basic grammar. Better get you’re coathangers ready liberals. The fact that an elected official doesn’t know the difference between “your” and “you’re” would be more troubling if not for the other problem: He’s making light of the horrific reality of unregulated abortions, which would undoubtedly become more commonplace if Kavanaugh chips away at abortion rights as conservatives (except, apparently, Sen. Susan Collins) fully expect. 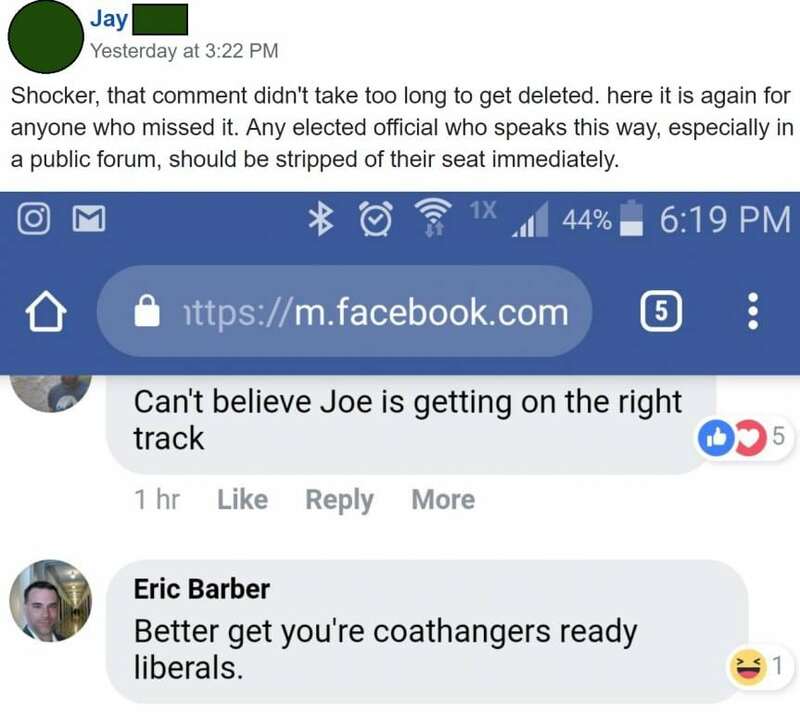 There are several screenshots of Barber making the controversial comment, posted in a group for current events in the “Mid Ohio Valley” area, but he quickly deleted it. His own constituents were quick to call him out on the remark. 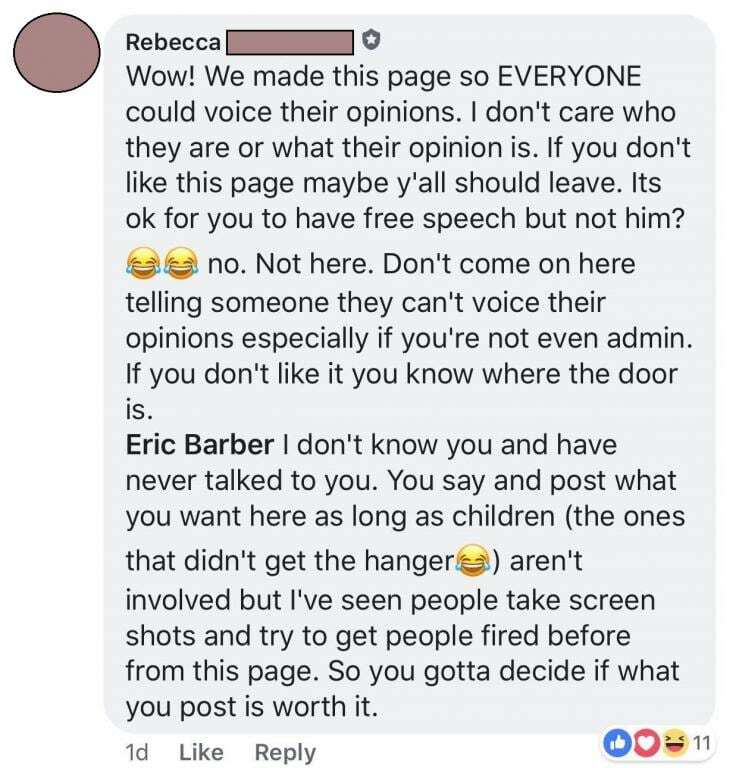 Although Barber got a lot of criticism from fellow members of the “unfiltered” group, he also got some support from an admin. After a quick scroll through Barber’s public Facebook posts, I found some more statements that might concern citizens. Barber seems to have little to no respect for members of the LGBTQ+ community, women’s rights, or the Constitution, so it’s not surprising that he has been in trouble for his behavior. In fact, according to a local newspaper report from last year, he has a pretty extensive criminal history. 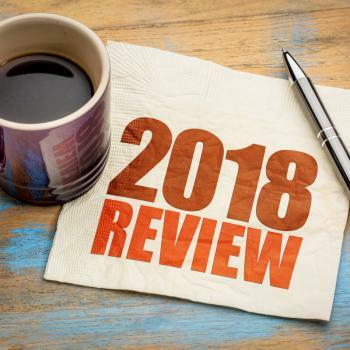 His arrest on misdemeanor charges of disorderly conduct and obstruction Monday was not Parkersburg City Councilman Eric Barber’s first brush with local law enforcement. He has an outstanding warrant from Belpre Mayor’s Court for failure to appear in 2013 on a possession of marijuana charge, had his driver’s license reinstated earlier this year after a 2012 driving under the influence charge and served time in the state correctional system after pleading guilty to breaking and entering in 1999. Just three months after his arrest, Barber left the Democratic party because a local party leader was publicly supporting the separation of church and state. 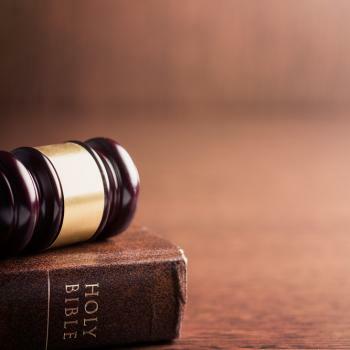 Barber said the idea, guaranteed by the U.S. Constitution, amounted to “anti-Christian rhetoric.” As if government neutrality on religious matters were somehow a way to persecute people of faith. With an attitude like that, good riddance. People like that shouldn’t be Democrats. This is a man who has repeatedly insulted some of the most vulnerable people in our society, including his own constituents. 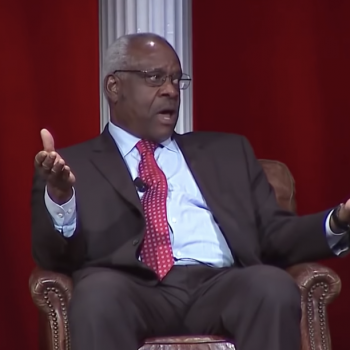 He delights in the idea that women who might need abortions — many of whom, it should be said, are conservatives — may have to resort to often-fatal back alley abortions. He also shows no respect for the secular nation that our Founders clearly envisioned — or for the law in general. He may have deleted the comment, but his ideas haven’t changed and he has yet to apologize. 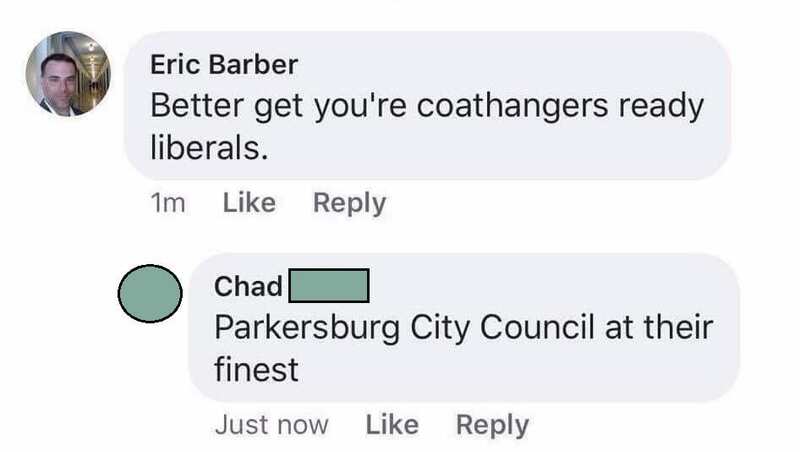 All the more reason to spread his words and make sure the people of Parkersburg are aware of them so they can make a more reasoned decision the next time they have to vote for city council. 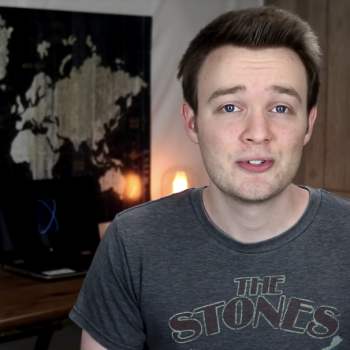 "I have found that KJV only cultists generally know less about the bible and its ..."
Missouri Lawmaker Misrepresents Study to Say ..."
Christian Bigot: If Pete Buttigieg Gets ..."
""ed: Nowhere does it imply that individuals should do this routinely but they do in ..."
At Long Last, These Old Purity ..."